(Beijing) — China's "Big Five" state-owned commercial banks plan to set up their own asset management subsidiaries to deal with debt-for-equity swaps, a move that is part of the central government's broader effort to decrease companies' financial leverage. The five largest state-owned commercial banks plan to each establish a subsidiary with their own respective funds of about 10 billion yuan ($1.5 billion) to execute debt-for-equity swaps for debt-ridden companies, bank sources told Caixin. 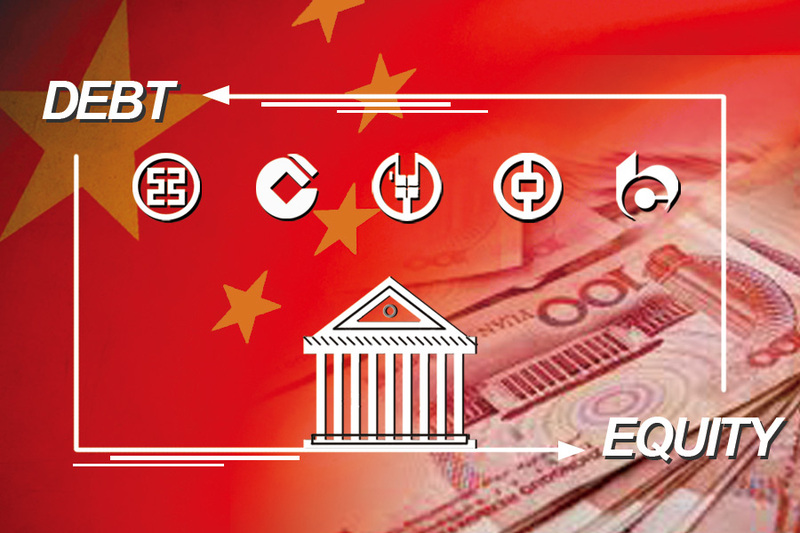 China's big five banks are the Industrial and Commercial Bank of China, China Construction Bank, the Agricultural Bank of China, the Bank of China, and the Bank of Communications. The Agricultural Bank of China announced on Tuesday night that it will set up an asset management firm, a wholly owned subsidiary, with registered capital of 10 billion yuan to purchase debt and convert debt into equity, as well as to hold, manage and dispose of equity in companies involved in debt-to-equity swaps. China Construction Bank has already announced on its website seven debt-reduction deals with a total value of 95 billion yuan. The plan is part of a central government drive that includes encouraging mergers and acquisitions, debt-for-equity swaps and bankruptcies to reduce mounting debts incurred by companies, particularly those in sectors with excess capacity amid the ongoing economic slowdown. According to the People's Bank of China, the nation's central bank, loans granted to the real economy by the end of October reached 103.35 trillion yuan, and corporate bonds 17.57 billion yuan. Earlier in October, the State Council, China's cabinet, proposed a market-oriented program to fight against rising corporate leverage. In the program, banks are allowed to transfer their debt to a third-party executor who then converts the debt into equity and sells the equity at a price and time to be negotiated. It is unclear whether the executor will buy the debt at full value or at a discount. The State Council is encouraging asset management companies, insurer-affiliated asset managers, state-owned investment firms and subordinate units of banks to act as executors to fund debt-for-equity swaps. But banks are not allowed to transfer debt to their own asset management firms. "We hope to make use of a specified unit and a group of professional experts to do it right for the whole chain of business of raising funds, the daily management of the holdings of equity in the company, as well as the later selloff," said an executive at one of the big five banks. "Otherwise, different staff and businesses will be mixed together in the banking system, which is not good for guarding against potential risks." The plan to set up such subsidiaries still needs to be approved by regulatory authorities.